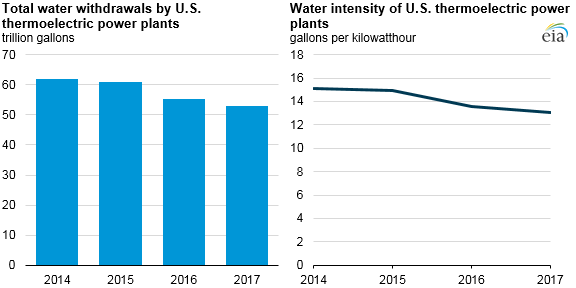 Water withdrawals by U.S. thermoelectric power plants reached 52.8 trillion gallons in 2017, continuing a decline in withdrawal volumes since 2014. 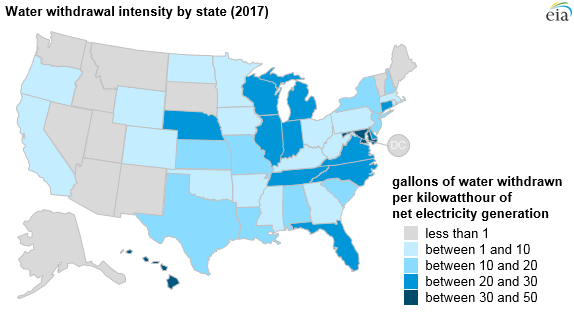 The water intensity of total U.S power generation—the average amount of water withdrawn per unit of total net electricity generated—fell from 15.1 gallons per kilowatthour in 2014 to 13.0 gallons per kilowatthour in 2017. Thermoelectric power plants withdraw water from sources such as rivers or lakes to cool equipment used during the process of generating electricity. After withdrawal, the water is either consumed, meaning it is lost to evaporation or blowdown during generation, or the water is diverted or discharged back into a body of water. According to the U.S. Geological Survey, electric power generators are the largest source of U.S. water withdrawals and account for about 40% of total water withdrawals in the United States. Thermoelectric power plants require cooling water to cool and condense steam that is used to drive steam turbines. In 2017, the total volume of water withdrawn by thermoelectric power plants in the United States was more than twice the amount that flows over the Niagara Falls each year. The decline in water withdrawals by thermoelectric generators has mainly been driven by changes in the electricity generation mix. 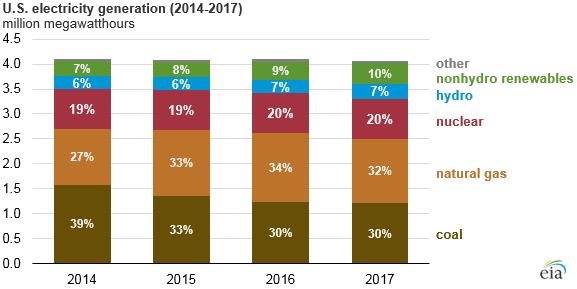 Between 2014 and 2017, the coal share of U.S. electricity generation fell from 39% to 30%, while the natural gas share increased from 27% to 32%, and nonhydro renewables increased from 7% to 10%. Electricity generation from renewable resources such as wind and solar requires almost no water, and combined-cycle natural gas power plants, which account for much of the natural gas-fired generating capacity added in the past two decades, require less water on average than a coal-fired power plant. The amount of water needed by power plants varies by region. In the eastern United States, where sources of water are more readily available, once-through cooling systems are more prevalent. Once-through cooling systems withdraw large amounts of water to cool the power plant, and they do not reuse water like recirculating cooling systems do. As a result, power plants in the eastern United States withdraw more water per unit of electricity generated than those in the west. Because water is scarcer in some western regions, many power plants in western states are fitted with recirculation, dry cooling, or hybrid cooling systems, which require less water for cooling than once-through cooling systems. For example, in 2017, Maryland’s water intensity was 47 gallons per kilowatthour, the highest in the country. Nearly 90% of the state’s electricity was generated from thermoelectric power plants, of which 65% was accounted for by units equipped with once-through cooling systems. Utah and Arizona have a similar electricity generation mix as Maryland; more than 88% of each state’s electricity is generated from thermoelectric power plants. However, because the thermoelectric power plants in Utah and Arizona are equipped with recirculating cooling systems with cooling towers, the water intensity in those states was less than half a gallon per kilowatthour.